For XJs with 4" or more of lift. The rear suspension on Cherokee XJ models is capable of providing incredible axle articulation when properly modified. However, it can be very difficult to find a set of long-travel shock absorbers that are compatible with the vehicle's weight and factory shock mounts. Most long-travel shocks are valved for heavier vehicles, and when installed on the relatively lightweight XJ the ride quality is simply unacceptable. The few long-travel shocks that are valved appropriately for the XJ are rarely offered in the size needed. In other words, you are forced to make a compromise between performance and comfort. Four rear mounting configurations enable optimization of shock performance and suspension travel for each application. Angled shock position produces a cantilever effect for greater suspension travel, while mechanical advantage improves ride quality with firm valved shocks. Increased suspension travel achieved with existing shock absorbers if Rear Axle Shock Mount is installed at same time. Heavy duty shock mounting studs eliminate factory bar pin design for improved bushing longevity and reduced noise. New mounting location increases selection of compatible shock absorbers and improves access for painless adjustments. 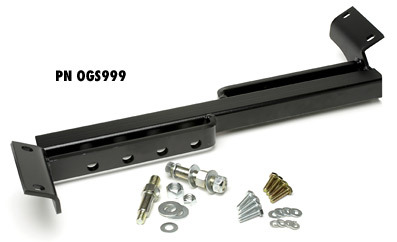 Install optional Rear Axle Shock Mount PN OGS922 at same time for greater suspension travel from the existing shocks. Without PN OGS922, it will be necessary to install longer shock absorbers to achieve full suspension travel. The Adjustable Cross-Over Shock Mount reconfigures the rear shock mounting points for much greater control over shock selection, performance and ride quality. It provides Cherokee XJ owners with four upper shock mounting locations as opposed to the single location supplied by the factory. The improved mounting flexibility makes it possible to optimize shock performance and suspension travel for each unique application. By relocating the upper mounting points toward the vehicle's center, the shock absorbers are positioned at an angle instead of vertically. A shock absorber mounted at an angle produces a cantilever effect that results in greater compression and extension when measured at the wheels. The reclined shock position also provides a mechanical advantage which improves ride comfort on shocks that would otherwise be too firm if installed in the vertical position. With the Adjustable Cross-Over Shock Mount installed, the inferior factory bar pin is replaced with a heavy duty stud and washers. This allows proper preloading of the upper bushing, thus improving longevity and reducing noise. Access to the upper shock mounts is also improved, making adjustments quick and convenient. The lower shock mounts remain positioned fore and aft of the axle to prevent spring wrap. When combined with our optional Rear Axle Shock Mounts, the lower mounting points are raised 3" allowing greater suspension travel with the existing shock absorbers.